Michael Arrington just announced his departure from TechCrunch, the popular tech blog that he founded—but it looks like he won't be disappearing completely. In the lead up to this week's TechCrunch Disrupt conference, one of the big questions in the startup world was whether Arrington would make an appearance after the controversy over the launch of his venture capital CrunchFund. In fact, he was the first person to take the stage, acknowledging that there has been "a little drama right now around TechCrunch" and saying he wanted to get the speculation out of the way. 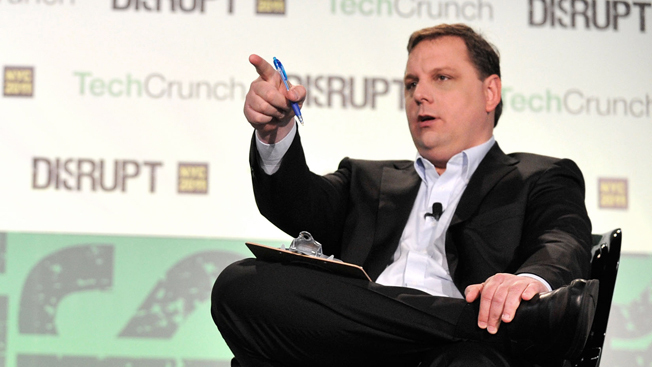 "It's no longer, I think, a good situation for me to stay at TechCrunch," Arrington said. When Arrington announced the CrunchFund, he and TechCrunch-owner AOL seemed to be constantly revising their statements about Arrington's ongoing involvement with the site, given the potential conflict-of-interest. At first, it sounded like Arrington might be scaling back his role at TechCrunch but would continue to be involved as a writer. Then it was rumored that he was being pushed out from AOL entirely, due to the backlash from the press and from Arrington's boss Arianna Huffington. Arrington and his writers took to TechCrunch to protest AOL's treatment, with Arrington going as far as demanding that AOL either reaffirm its commitment to TechCrunch's editorial independence or sell the site back to its previous shareholders. Neither of those things happened. Instead, Arrington's departure from TechCrunch and from AOL will be effective in a few days, he said. AOL, meanwhile, will remain an investor in the CrunchFund, and he said it would be releasing its own statement soon. The AOL statement followed shortly. "The TechCrunch acquisition has been a success for AOL and for our shareholders, and we are very excited about its future," AOL's Maureen Sullivan said on behalf of AOL. "Michael Arrington, the founder of TechCrunch, has decided to move on from TechCrunch and AOL to his newly formed venture fund. Michael is a world-class entrepreneur, and we look forward to supporting his new endeavor through our investment in his venture fund. Erick Schonfeld has been named the editor of TechCrunch. TechCrunch will be expanding its editorial leadership in the coming months." Arrington often displays an irreverent, confrontational sense of humor on stage, but he seemed unusually serious and emotional, saying he was proud of keeping the TechCrunch team together for the past year, following its acquisition by AOL, which was announced at last year's Disrupt event. He did make a few jokes about the change, revealing a T-shirt that said, "Unpaid Blogger." And when he interviewed LinkedIn founder Reid Hoffman, Arrington asked, "Where did I go wrong?" Hoffman, who is an investor in the CrunchFund through his firm Greylock Partners, recalled his discussion with Arrington before the announcement about potential criticism, and how they'd assumed the backlash would just blow over. Nonetheless, Hoffman said he still feels confident about the fund, even though it's no longer affiliated with TechCrunch. "I would invest in the Mike Arrington fund because of your own network, and I would do that independently," Hoffman said.